There are no limitations to what a pen can draw over a topographical map, and that was the beginning of an adventure that brought six young trampers together, all aged under 25. With the generosity of the FMC Youth Scholarship, we planned to traverse 80 kilometres of the Tararua Ranges from Shannon to Kaitoke. All of us were new to the range, and the Tararuas burned (and rained) into us memories of challenge and triumph. In this rugged, beautiful terrain we built friendships to last a lifetime. We set off from the Number One Upper Mangahao Reservoir on 27 December 2015, and aimed to tramp along the spine of the range, traversing Mts Crawford, Hector, Aokaparangi, the Tararua Peaks and Alpha, with a planned finish of 4 January 2016. The first leg was a medley of clambering through beech forest and streams. Gargantuan trunks, covered in moss, lay beside the track and provided relief to the deceptively flat contours alongside the riverbank. The Tararuas Range is rugged, and we were surprised by the reduction in our accustomed average speed. It took us six-and-a-half hours to walk the eight kilometres to Mangahao Hut. On the second day, it took us 12 hours to tramp from Mangahao to Dracophyllum Biv. The first two days were perhaps the most challenging of our journey, and yet the most fruitful for group learning. While we were all conditioned to the rigours of multi-day trips, this was the first traversing solely along ridgetops. The Tararuas are often wet, windy and exposed. However, in the blaze of full summer, the route was swelteringly hot – and this posed different challenges. Our climb from Te Matawai to Arete took us three hours, and by then the sun had reached its zenith. With the heat reflecting over the range, fully laden packs and the lack of tree cover, we found ourselves stopping every 300 metres in order to keep the group together. Dehydration was of concern throughout the journey, but fortunately David’s military training had given him a good knowledge of regulating our water intake. We often drank three or four litres a day. Following a harrowing 12-hour day on the tops, we sat outside Dracophyllum Biv and had a conversation about our progress. It was a challenging discussion among six individuals, each with their own ideas and experience. We created a set of goals that set us in good stead for the days to come – setting off earlier in the day, meeting at sign-posted points if the group split, and redistributing the weight of gear to improve our group speed. The Tararua Ranges pushed us all but through discussion we grew in strength. From Dracophyllum Biv, we tramped to Nichols, over Mt Crawford and on to Anderson Memorial Hut. From there, we scaled Aokaparangi and made our way to Maungahuka for our fourth evening. Slinging on boots early in the morning had become our established routine, while in the evenings we watched the sunsets in silence. This provided perhaps the most memorable experiences of the journey. Imagine spending the day walking along ridgetops under a raw, blue sky. Imagine arriving at an old hut. Just as the sky becomes dark, you shake out the stiffness in your muscles and settle among the warm tussocks alongside your friends to watch the sunset over the distant Marlborough Sounds and Kaikoura Ranges. We spent New Year’s Eve on one such mountainside. We sat until the sun disappeared and Sirius appeared, along with the new moon. On our fifth day, we were to tackle the Tararua Peaks. The forecast was for wet weather, prompting a group discussion about the route, key landmarks and the risk of losing each other in the mist. One of us had misplaced a rain-jacket, so we crafted a wind cover from a plastic bag. Traversing the peaks would be our time of reckoning, we knew, as we negotiated the increasingly rocky terrain down towards the ladder. A carved pathway led to jagged rocks, and gradually this shifted into a section of the route safeguarded with chains. Visibility was down to 10 metres as we snaked our way along the ridge, finding occasional shelter behind tussocks. The peaks were breathtaking, and traversing them in the mist only served to increase their beauty. It was an experience of howling wind, of walking among tenacious alpine plants such as mountain daisies and vegetable sheep. Beyond, we traversed McIntosh, Yeates, Vosseler, Boyd-Wilson, Bridge Peak, Hut Mound and arrived at Kime Hut in time for lunch. We lingered for two hours, and spent the afternoon recuperating from the feast. A German couple later found all six of us snoring in the hut. Ahead lay the Southern Crossing. A leisurely ascent led to Mt Hector and the Memorial Cross. Toby demonstrated minimalist footwear by crossing The Beehives in his infamous tramping jandals, but they snapped after 30 minutes. To the bemusement of the rest of us, he tramped barefoot over Atkinson, Aston and Alpha to Alpha Hut. Apparently it’s all about ‘where you position your legs’. After lunch at Alpha Hut, we continued on. The aptly named Hell’s Gates was hot in the sun, and the lost height had to be made up again straight away before we reached Omega. During the rest of the afternoon, we descended 800 metres to Tutuwai Hut, where we were welcomed by the fresh water of the Tauherenikau River. Time for our first bath! Rain gently pattered for our final walk, down the Tauherenikau River, up Smith Creek and out to Kiwi Ranch. The cover of trees and whispers of water were a welcome change to arid slopes. It seemed apt that the tramp ended on a river-side track, just as we had begun eight days ago. The traverse of the Tararua Ranges was a week-long journey that challenged us with its terrain and climate in ways that we had not imagined. Collectively, we learnt not only more about this rugged, stunning piece of New Zealand geography but similarly grew as a team and as individuals. Would this route or place be recommended for others in the future? Most certainly. It is clear why the Tararuas are described as the ‘birthplace of New Zealand tramping’. We were driven to not only adventure, but to learn. We scaled mountains, navigated rivers and planned routes together. 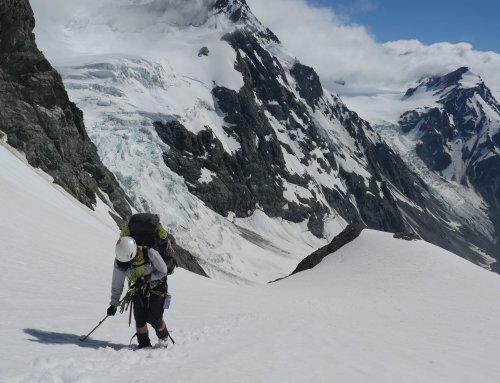 Thanks to FMC’s support, six young trampers were able to traverse the Tararua Range. You can donate to the FMC Mountain and Forest Trust, by clicking here.